A six-story-tall building collapsed on one of four; authorities are still looking for people trapped under the rubble. The works to recover them have not been simple. The corpses were in places of difficult access, and also, as a result of the crushing, it has been difficult to identify the bodies. Although only five bodies have been found, it is estimated that the number could rise to 50. Several people have already been called to testify in order to try to clarify what happened. On the other hand, at least five people have died when a building in construction collapses on a smaller one in the city of Noida, which borders New Delhi. There, authorities are still looking for people trapped under the rubble. In both places rescue teams work with trained dogs to accelerate the search and rescue operation. In the latter city, Krishan Kumar, a relief agency official, said more than 100 lifeguards were working with cranes and drills to remove the debris in the village of Shahberi, located about 40 kilometers east of New Delhi. The largest building was under construction, and there were no workers living inside it. It is also unclear which building collapsed first, as there was a lot of dust and people could not even identify which of the two fell in the first place. 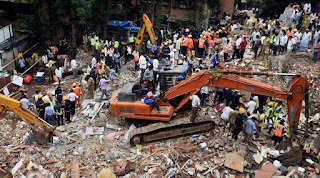 Fire chief Arun Kumar Singh said at least 12 workers were in the building at the time of the collapse and are believed to be trapped under the rubble, the Press Trust of India news agency reported. Landslides are frequent in India, often due to the precarious state of infrastructure and lack of maintenance, factors fueled by corruption and illegal practices that dominate the construction sector. Also monsoon season, from the end of june to september, can be very dangerous for old structures. At least 18 people died in May when a flyover collapsed in northern India, crushing vehicles and passengers under tons of concrete. On the other hand, on last May, fifteen people were killed and 12 wounded in the collapse of a causeway under construction in the state of Uttar Pradesh, in northern India, under which dozens of people and vehicles were trapped. In 2013, at least 72 people died in Mumbai in the worst collapse in recent decades.